Help Toto throw one heck of a party in this fun service and management game. Serve Tea and Cookies and other treats to his happy friends! What better way to start out the new year than with the young and fun Baby Hazel? She's a young girl who loves exploring the world a little bit at a time. This is her first New Year's party, and she's going to meet so many new people. Maybe at the end of this party she'll meet someone she can have a fun playdate with! 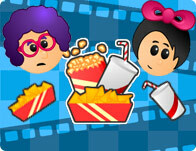 Use your mouse to click on the different options and complete the fun party tricks.